Wow - looking outside here in Seal Beach, it hard to imagine a more beautiful Saturday! Wind and rain have cleared the sky and today we are left with sunshine - a perfect day for gardening! "Annie B Gilroy" is a 1907 heirloom, fragrant and vibrant cerise color. "Cupani" was cultivated by a Sicilian monk, Father Cupani, in 1695. It's intensely scented and a really cool deep pruple-blue, violet color. "Senator" is fragrant and heat tolerant, a very impressive pink and rose 'splattered' color. At just $3.50 for a 4", out Sweet Peas are not only unusual and colorful, but a great buy. Plant now and have some early surprises in your spring garden! 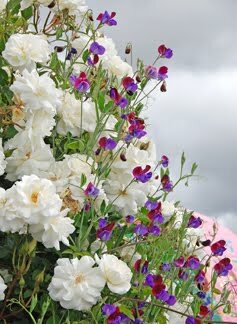 You can read more about Sweet Peas at Renee's Seeds great website as well. We have much more in our gardens for you this weekend as well - stop by and see us! I LOVE sweetpeas! I will for sure have to get some to plant!! Lovely weather! New plants! Sale!